Vibrant and soaked in tradition, India is a confection of culture, colours and coastline. However, Goa speaks a more westernised language of this sub-continent, where you'll find bright local markets stacked with spices and silks, action-packed sandy beaches fringed by the Arabian Sea and exotic local cuisine. Whether you’re planning a far-flung family holiday or exploring this dreamy destination with your partner, we've highlighted the best things to do in Goa so you can make the most of this spectacular state. 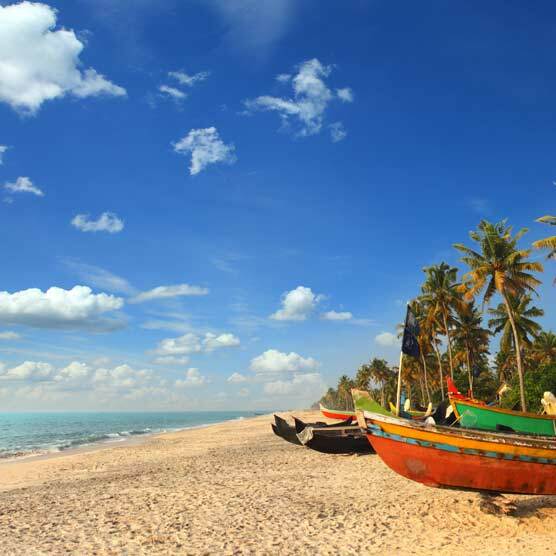 For many, Goa holidays are all about Caribbean-style sands and their lively beach-party scenes. North Goa boasts a long strip of bustling beaches – like Calangute, Candolim, Baga, Anjuna, Vagator and Arambol – and a prom that dots the northern coastline with quaint shacks, classy bars and waterfront restaurants. South Goa unfolds a somewhat slower pace in this party state, with gorgeous beaches to lounge on including Galgibaga, Colva and Palolem, chic seafront hotels and a lush landscape of coconut groves and paddy fields. If you prefer tranquillity and scenic beaches over perky party crowds, then you know where to find your spot. North Goa, in comparison, is abuzz with activity thanks to its vibrant towns, broad beaches and ecclectic nightlife. It's not only about the beaches. India's west coast is a treasure trove of culture, history and tradition with plenty to explore beyond its gorgeous, white-sand exterior. If you fancy ticking off the sights, visit the stunning ancient Hindu temples, the Brahma temple in Carambolim and the Mahadev temple of Tambdi Surla. You can also marvel at UNESCO World Heritage Site Basilica de Bom Jesus, which holds the mortal remains of the missionary Saint Francis Xavier. Goa’ capital, Panaji, equally plays an interesting role in the state’s rich art and culture scene, with the bustling city housing a selection of charming galleries dedicated to local Goan artists. If you admire nature and its wonders, then head to the Dudhsagar Falls - one of the tallest waterfalls in India, which looks like a heavy stream of milk flowing effortlessly from the hilltop. Exhilarating watersports. Whether you’re visiting Goa for its diverse culture, culinary delights or gorgeous coastlines, the watersports should be on everyone’s to-do list. Calangute, Baga, Anjuna and Vagator in North Goa are prime spots to try snorkelling, fly boarding, kayaking, skiing, parasailing, banana boating and windsurfing. But, it’s not only North Goa that claims such thrills and spills, Grande Island is an ideal place to try your hand at scuba diving. Explore multi-coloured marine life, vibrant corals and exotic fish. Goa has a handful of action-packed towns that boast a lively atmosphere, with Baga and Candolim two of the most popular spots to spend time at. Wander the culture-rich streets and you'll be met by a medley of local market stalls selling spices, chunky jewellery, hand-made wood carvings, local delicacies and the famous feni. The Saturday Night Market in Arpora is where to head if you want to spice up your wardrobe, followed by well-deserved cocktails at The Boutique House. It's also worth visiting Anjuna Flea Market, Mapusa Market, Calangute Market Square and Mackie’s Night Bazaar (which runs from November to April). “You can’t think until you’ve eaten well” is a popular Konkani proverb, meaning food is taken very seriously in Goa - and with such delectable dishes it's no surprise! Goan cuisine is a beautiful fusion of Konkan, Portuguese and Arabic flavours. The most popular local drinks are port wine and spirits like urrac and feni. Goa is a haven for meat lovers, with flavoursome favourites like chicken cafreal, mutton xacuti and pork vindaloo on the roll. While you're visiting, get a real taste for India and try out lesser-known lip-smacking delicacies, including Goan-Hindu vegetarian preparations such as vegetable caldinha and mix veg xacuti with rice. From pretty seafood shacks to upbeat beachfront restaurants and bars, Goa impressed with its wide range of wining and dining options. If you’re looking for a tropical restaurant where you can kick back and eat, then try Ku Goa in Morjim. Or, spend a romantic evening with your partner at A Reverie in Calangute, an open-air restaurant with a private gazebo that will sway you away with its chic facade and decor. Or if you fancy an evening of chill and grill, hit Barrels and Bones in Panjim. A classy steakhouse that serves BBQ grills and meaty steaks with pizzas, burgers and salads, too. Imagine the sea breeze in your hair, soft sand between your toes, upbeat party music in your ears and a beer in your hand; holiday goals right? Lucky for you, the nightlife in Goa is fabulous and the credit goes to its amazing beach parties, stylish seafront clubs and ambient live music scenes. We've listed the top 6 spots in India's party capital you simply cannot miss. Silent Noise-the club, Palolem: India’s original headphone party club. SinQ, Candolim: Trendy and upbeat bar that comes with a combination of a Goan tavern, a poolside lounge and a nightclub. Tito's, Baga: The oldest and original haunt of the hippies and alike. Club Cubana, Arpora: Known for its brightly neon-lit, multi-levelled dancefloors. Love Passion Karma (LPK), Nerul: Riverfront club with unique sculpted terracotta dancefloors. Waters beach lounge and grill, Vagator: Party here with the rich and famous.